In 1987, Surf detergent came out with a series of books featuring Topps baseball cards from 1952-1986. 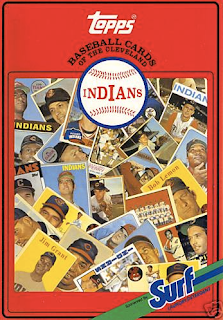 The book has a bright red cover and shows a pile of Indians cards worthy of a banner for the top of this blog. Inside, pages show each and every base-set card Topps produced for the given year. The sets are divided up into the respective years, and each year's cards begins with a paragraph talking about the Indians ups and downs for that year. 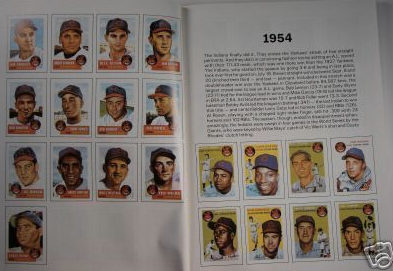 The back of the book features sections called "Pitching Record and Index" and "Batting Record and Index" respectively. There is also a section at the back for autographs, and a coupon for 50 cents off a box o' detergent. Missing from the book are any spin-offs or subsets. For example, the 1965 Topps Embossed are no where to be found here. It's too bad they couldn't include EVERY Topps-made card from '53-'86, but this still holds up well as a reference. Though the images above are from theBay, I've had my copy of the book for many years. Since I am not very adept at identifying the older cards by sight, this book has been a great tool in figuring out which year a particular card was released. Braves, Orioles, Red Sox, Angels, Cubs, Whit Sox, Reds, Tigers, Astros, Royals, Dodgers, Brewers, Twins, Expos, Mets, Yankees, A's, Phillies, Pirates, Cardinals, Padres, Giants, Mariners, Rangers, and Blue Jays. HA! $4.95 off of feebay and the Braves are mine! You and me too! Heck,I have have trouble identifing the newer ones. I also have two Detroit Tiger Surf books ,if anyone is interested. I have Surf books for the Dodgers and Red Sox. The Red Sox one was purchased at Fenway Park. I have a complete set of these Surf books ie one book for each of the teams mentioned.